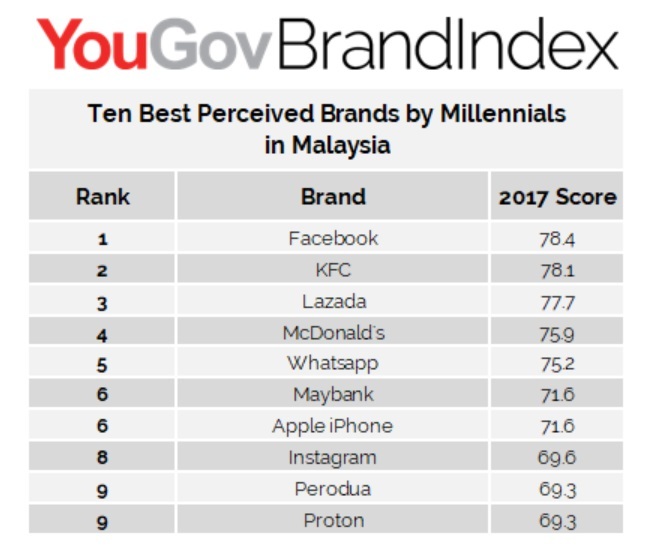 YouGov BrandIndex announces the top 10 best perceived brands among millennials in Malaysia. Facebook, KFC, and Lazada achieved the highest Word of Mouth Scores in Malaysia, outscoring McDonald’s and Whatsapp, which rank fourth and fifth respectively. The best perceived brand list is dominated by social media brands, with three out of the top ten coming from this industry. However, QSR and Casual Dining brands are also popular in millennials’ minds in Malaysia, with KFC ranked second and McDonald’s ranked fourth. Millennials, those were born between 1980 and 1999, are one of the largest and most technology savvy generations ever. Marketing to this demographic is a priority for established and emerging brands alike. Leveraging BrandIndex and its different measurement metrics, we can see which brands are the most popular in the eyes of this generation. BrandIndex serves as a valuable tool for marketers who want to tap into this key market. For this ranking, YouGov BrandIndex first screened all of its 1,500 brands for positive Buzz, which asks respondents "Have you heard anything positive about the brand in the last two weeks, through advertising, news, or word of mouth?" Brands with low response volume were eliminated. From those brands, they were then ranked on Word of Mouth scores, which asks respondents "Which of the following brands have you talked about with friends and family in the past two weeks (whether in person, online, or through social media)?" All respondents for this research were adults 18 through 34 years old. YouGov BrandIndex interviews thousands of consumers every day, yielding over 2.5 million interviews each year. Respondents are drawn from our online panels of 5 million consumers across 31 markets.